March 26, 2012 — John M. Buol Jr.
Bass Pro Shop in Springfield, Missouri is looking to hire a gunsmith. March 21, 2012 — John M. Buol Jr. This is a synopsis of the required maintenance of the Garand M1 and some accurizing measures to consider that may enhance performance. March 16, 2012 — John M. Buol Jr. Even starting with a pre-shaped stock leaves plenty of room for artistry in a custom rifle project. March 12, 2012 — John M. Buol Jr. Adding better sights or an optic is one of the best ways to sporterize an old military rifle. Despite being over a century old, issue Mausers are still great for customization work. March 8, 2012 — John M. Buol Jr.
Savage overlooks nobody with its line of O/U shotguns. There’s one to suit any size scattergunner. March 4, 2012 — John M. Buol Jr.
Several years ago the National Safety Council (nsc.org) published a report comparing reported injury rates of various activities in blocks of 100,000 participants. Based on their numbers, hunters experienced less than eight incidents via firearm-related injury per block, much safer than the injury rates of ping-pong (15), golf (104), tennis (119), bicycle riding (904), soccer (910) or baseball (2089). Any form of organized shooting range activity, such as a match, is even safer than hunting. Data compiled recently by The Centers for Disease Control and Prevention have independently confirmed these numbers. From their web site (cdc.gov/injury/wisqars) the CDC’s WISQARS (Web-based Injury Statistics Query and Reporting System) is an interactive, online database that provides fatal and nonfatal injury, violent death, and cost of injury data from a variety of trusted sources. Researchers, the media, public health professionals, and the public can use WISQARS data to learn more about the public health and economic burden associated with unintentional and violence-related injury in the United States. The National Shooting Sports Foundation tallied the CDC’s numbers on WISQARS and reconfirmed what sane people with firearms experience already knew: Shooting and hunting with firearms is safe. In fact, shooting and hunting with firearms is one of the safest recreational activities in America. The NSSF’s report on the CDC’s compiled data shows hunting ranks third in safety when compared to 28 other recreational pursuits, ranging from baseball to wrestling. Hunting with firearms has an injury rate of 0.05 percent, which equates to about 1 injury per 2,000 participants, a safety level bettered only by camping (.01 percent) and billiards (.02 percent). For comparison, golf has an injury rate of 0.16 percent (1 injury per 622 participants), while tackle football topped the list of activities with an injury rate of 5.27 percent (1 injury per 19 participants). 105 more times likely to be injured playing tackle football. 16.3 million hunters took the field last year and approximately 8,122 of them sustained injuries of any kind (50 per 100,000 participants.) The vast majority of hunting injuries – more than 6,600 – were tree stand-related. It’s not just in the hunting fields that firearms are being used safely either. 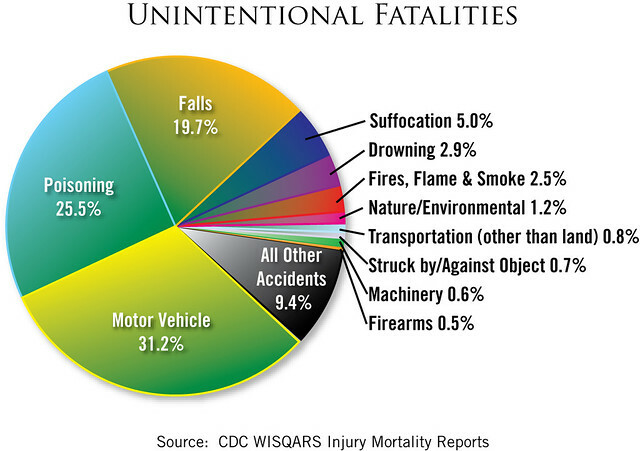 The CDC also reports that firearms constitute just 1/2 of 1 percent of all unintentional fatalities in the United States, including those in the home. The injury data NSSF used to compile this hunter-safety report comes from the National Electronic Injury Surveillance System of the Consumer Products Safety Commission 2010 and the International Hunter Education Association’s Hunter Incident Clearinghouse. Activity participation figures are from the National Sporting Goods Association Sports Participation in 2010 report. Read more in our March 2012 issue. Back issues are available. Don’t miss a single issue. Subscribe today! March 1, 2012 — John M. Buol Jr.
Here’s your newest new from Shooting, Hunting and Outdoor Trade!